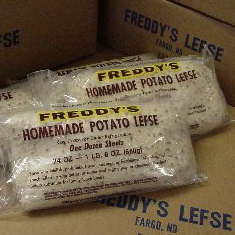 [%image lefse float=left width=150] Potato lefse — a traditional Norwegian flatbread usually served with lutefisk, but most tasty when spread with butter and sugar — can be shipped straight to you from Freddy's Lefse in West Fargo. Ya, sure, ya betcha. block(clear green). Have a favorite regional specialty from North Dakota? Share it in the comments section below.